David Griffiths considers the transformative power of recognition in a TEDx talk about his thinking behind Being Untouchable, an exhibition highlighting the injustice suffered by many of India's 167 million Dalits. Unlike most people, I have facing my front door a photograph of a man with leprosy drinking in the street. I do like this picture, somewhat against the odds. 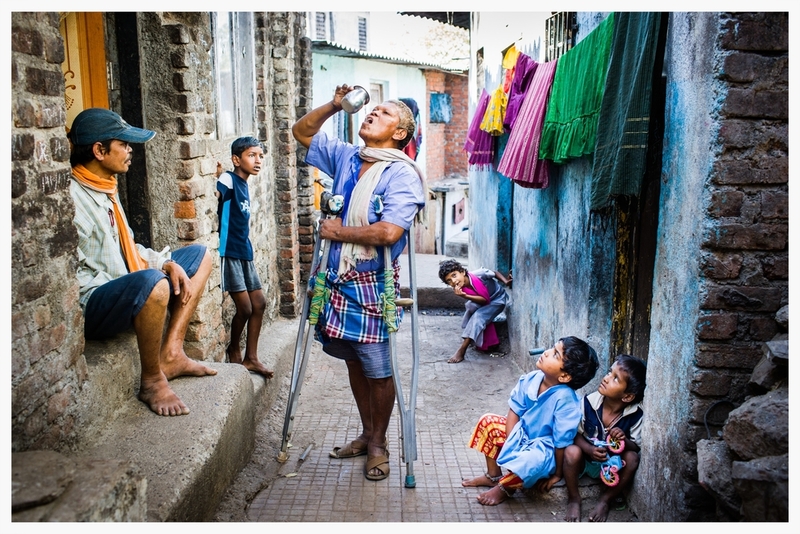 There is nothing to celebrate about leprosy: it is a disease suffered vastly disproportionately by the poor and disenfranchised, and leads to great suffering through secondary causes as the sensation of pain is lost: blindness and disfigurement are common. Despite the fact leprosy is easily cured and indeed not easy to contract, the World Health Organisations says that there were over 200,000 new cases in 2014. But the man in the picture is not defined by his disease, nor by the deprivation which gave it to him. He is a figure of life and intrigue in a colourful scene which looks so strangely perfect that it could all be staged (it isn’t). It’s a photograph which demands a story, a punchline. That story, though, is simply the intrinsic dignity of a man treated as a pariah, an outcast in society. It is the story of his need for water, just like mine; of the dexterity of his manner of drinking; of his unexplained command of the attention of all around him as he stands centre-stage. The photograph was taken by Marcus Perkins. I approached him for this work several years ago after scratching my head about how to find an accessible way to communicate the routines of marginalisation, discrimination and violence suffered by the once-called untouchable people of India, the Dalits. What I wanted to do was find a way to provoke a sense of solidarity across unbridgeable gulfs of society, culture, language, economy; to urge compassion; and to call for justice. All the tools that were available seemed inadequate. There were statistics that were hard to get our heads around: that according to the census data we had available at the time, the number of Dalits matched the populations of the UK, France and Spain together. But quantitative data is never enough to make us care. There were nuances and subtleties that defied easy explanation, but needed not to be ignored: we could make no easy correlations between caste and wealth or power. And then there were the people behind these walls. What could be done to present their stories with authenticity and forge a sense of connectedness to them and their tribulations? So we turned to photography to open some vignettes into the dramatic and the banal ways of how untouchability is experienced. Of course, nothing would have been possible without people opening their lives to us, sharing their stories and their routines; and that would not have been possible without trusted activists and community leaders vouching for us - people who lead the local struggles for change. So it was that, lubricated frequently by chai, we set out to create a set of photographs which conveyed the fundamental beauty and dignity in the often terribly sad stories of some of those marked as untouchable. Jaya's brother was the breadwinner, sweeping the streets of the nearest city. The family would never be rich but they got by ok. For them this was a story of stunted opportunity, living as they did segregated from the rest of the village. Uma’s job by virtue of birth was to gather up the human excrement from a dry latrine in a village in southern Andhra Pradesh, which she carried in a basket on her head to a dumping ground. Many of the 800,000 who performed this appalling job found themselves unable to eat, often becoming sick and dying very young. In a bizarre twist of irony, her own home had its own toilet. She was above the indignity foisted upon her. When the body of work was finished, we called it Being Untouchable. There was the young girl, thrown onto a heap of burning ashes in reprisal for treading on a path reserved for those more socially elevated; the men whose family home had been burned down in caste violence; the community known as rat-eaters for the extremity of their poverty whose daughters would, against all the odds, learn. There were the temple prostitutes, the destitute, the child labourers, the rubbish pickers, the survivors of violence. The resulting exhibition went first to a gallery in Old Street, then to St Paul’s Cathedral, and was featured by the BBC, Guardian, and a bunch of other media. We printed them with a tough laminate which people could run their hands over, repudiating untouchability with touch. I do not make any great claims for the impact of this work as a piece of advocacy. But we believed that simply to unmask the deep dignity of those suffering daily humiliation and invite the viewer to meet them on an equal footing was a small transformative act, appealing to the basic human instinct for solidarity which can overpower all that separates us. There are many easy ways to reinforce separation. We are so often prone to language which closes doors. We who do human rights work need to take care to avoid language which distances and objectifies: victims, rights-holders. Nobody, of course, is defined solely by victimhood. But more than that, if we are not careful, the language we use in conversations, in the media, politics, creeps towards a dehumanising quality, reinforcing otherness and creating categories which become intractable. Perhaps none is more chilling than the words we use for the stranger among us: an illegal, or an alien. Identity is profoundly important. We need categories to define ourselves and our place in the confusing tangle of the world and its history. We need to belong to groups, to classify ourselves and those around us. But, when we solidify these groups too much, our consequent failure to recognise each other’s humanity is one of the root causes of our injustice towards each other. I think we are all guilty of this. Our need for self-justification leads us to tell exclusionary narratives: I am different from you, therefore superior; we are better than them. Every -ism, racism, sexism, casteism, begins with a claim to superiority and a failure to recognise in the other the commonality of our humanity. So, as we fight against injustice, how can we pull back the curtain of this delusion? What can we do to move from exclusion to solidarity? How can we recognise the humanity in each other as the starting point in our interaction together, beginning a trajectory of reconciliation rather than rejection? If my small experiments with a photographer have taught me anything, it is that there is something deeply transformative about recognition: Beginning with a recognition of dignity, of equality, of humanity in the other, we can demand much more of ourselves in confronting the ugliness of the world. Because what really matters more than to reimagine horror as beauty, to love the one thought unlovable, to touch the one considered untouchable? How are you going to do it? David Griffiths is Head of the Secretary General's Office at Amnesty International. View Being Untouchable, a series of intimate portraits illustrating the injustice, poverty and inequality suffered by many of India's 167 million Dalits.